Produced by Fun Entertainment, Hong Kong’s first 5D musical The Storm Show <風雲5D音樂劇> will officially start playing at the Hong Kong Coliseum starting April 6, 2017. The musical is one of the many media adaptations of Hong Kong’s very own manhua series Wind and Cloud or Fung Wan <風雲>, a story about two young fighters and their journey through the wuxia world, becoming jianghu’s most skilled martial artists. Kevin Cheng (鄭嘉穎) and Michael Tse (謝天華) star as the two protagonists, respectively as Cloud and Wind. Patrick Tam (譚耀文) plays Nameless and Ray Lui (呂良偉) stars as the main antagonist, the Lord Conqueror, Wayne Lai (黎耀祥) and Lawrence Cheng (鄭丹瑞) reprise their roles from earlier adaptations, respectively Mud Buddha and Jester. Janice Yan (閻奕格) is Hung Ci, and Bianca Wu (閻奕格) is Yu Chor-chor. The Storm Show cast has been going through daily rehearsals at the Hong Kong Coliseum to prepare for the upcoming great premiere. 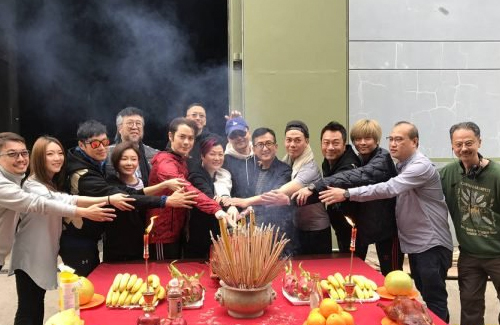 Yesterday, the cast and the production crew held a blessing ceremony for the show. Kevin and Michael were both sweating as they were just in the midst of rehearsals. Production for The Storm Show started over a year ago. The music is written by HKFA-winning composer Chris Babida (鮑比達), with lyrics by Keith Chan (陳少琪), who also helmed the lyrics for Snow Wolf Lake <雪狼湖>. Some of the numbers in the musical include the theme song “Rising Wind, Scudding Clouds” <風起雲湧> by Michael and Kevin, Patrick’s “Desire” <慾望面前>, and Michael and Janice’s “Butterfly Dream” <蝶夢>. The Storm Show will debut in the Hong Kong Coliseum on April 6, 2017. It will run for six shows—the first four shows will run from April 6 to 9, and the last two shows on April 15 and 16. Check out some of the songs below! @m0m0 I don’t even know who she is. Is she’s with Tvb before? Frost was my favourite character in the movie back then. I like him more than the 2 protagonists. Omg, Michael Tse looks sooo old in the production. Arent the protagonists supposed to be young or something?